4:00:09 marathon. A Very Very Long Time Ago. I don’t count them, more than a dozen, less than 50. 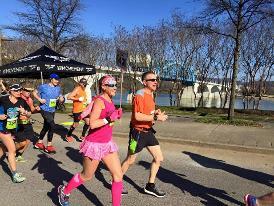 Every marathon is awesome because you can’t be out there for hours and not have something amazing happen. 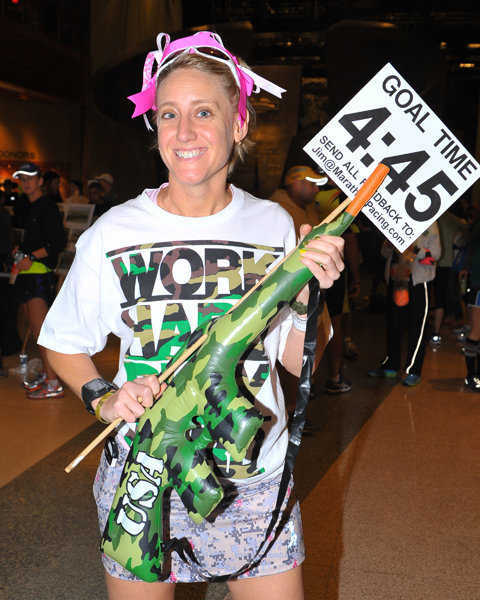 Fitness Consultant, Race Coordinator for a local Triathlon and timing company, mom to two busy kids ages 10 and 6. Sport Beans. I just discovered Stinger Waffles, awesome!!! Afterward, I love Cheez-its and Dr. Pepper. Reading, sewing, gardening, triathlons, making hand-built pottery. I like enjoying good food and drink with good friends. Anyone who will run with me. Usually my two Border Collies (Mary Francis is 11, Stuart is 9 months). Spark: The Revolutionary New Science of Exercise and the Brain, by John Ratey. Anything you could give today, you did, anything you didn’t give, is lost forever. I want to learn how to Knit. As far as running, I want to be running still when I’m 80 and 90 and…well, I may have to be buried with a treadmill. I’ve been running competitively off and on since I was 10 years old. I go out to sort out my problems and relieve stress. It’s my quiet time. It’s funny though, if there’s another human in sight, I can’t keep my mouth shut. Everyone who knows me knows to take me with them to talk and entertain them on long runs. 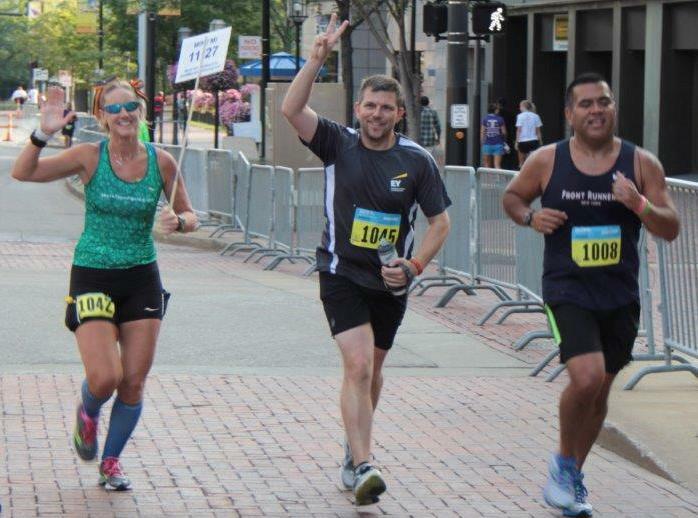 I ran my second marathon ten years and two children after my first marathon. I’d made some good running friends and they influenced me to get back into marathons. It was nice to know that I could still do it. I was barely slower than before and recovered a million times better. Because I think everyone has something to gain by running marathons, and people who are out there the longest need the most encouragement. I paced a guy once and he wrote the most beautiful letter to a friend about how he never would have finished without help. To this day he does not know I’ve seen that letter. Recently, I was doing interval work with a friend on treadmills in a cardio theater. There was a movie that took place in Pittsburgh. I started recognizing roads and telling her what was going on in that part of the race when I ran that marathon. We both had chills. Because even if I talk for hours and don’t say anything interesting at all, you’ll be amused by my southern accent. I talk A LOT. I’ve done a lot of races. There are a million stories. If you’ve done a race I haven’t, I’m going to want to hear about it. If you really get down and discouraged, we’re going to talk about our families and all they’ve given up so we could train to do this. I ride my bike to and from work most days. I’m always game for a road trip or a new adventure, don’t invite me ANYWHERE unless you’re serious. I love to work with teenagers at my church. With the triathlon company, we help raise money for a wide variety of charitable organizations. It’s nice to be able to use my passion for sports to help worthy causes.